It’s been like watching a slow-motion — and entirely preventable — train wreck: extreme austerity measures aren’t leading Europe to prosperity but driving the continent’s economy into the ground. This has seemed pretty obvious for a long time, but European policy makers have seemed somehow blind to the problem. We’re lucky here in the U.S. that we did not embrace extreme austerity measures — at least not at the federal level — or we’d be looking at a worsening employment situation rather than an improving one. 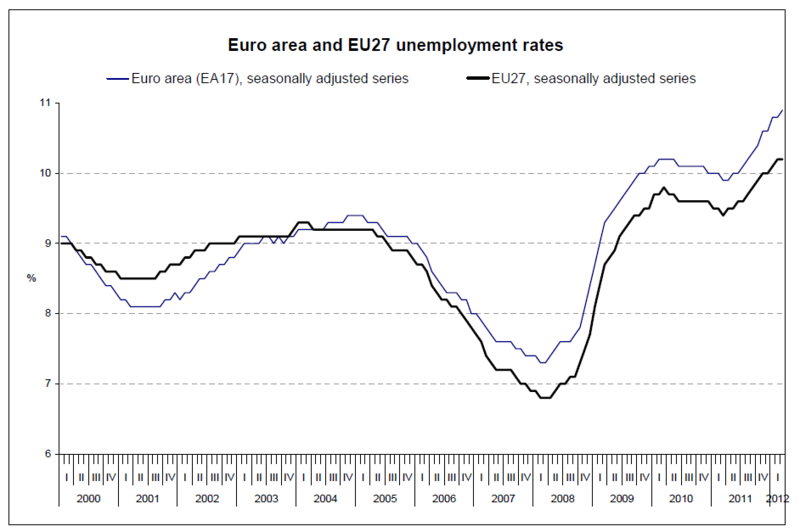 In new data from Eurostat (the statistical office of the European Union), the Euro area’s “seasonally-adjusted unemployment rate was 10.9% in March 2012, compared with 10.8% in February. It was 9.9% in March 2011.” The European Union countries fare better with a still-high 10.2%. Belgium (BE), Bulgaria (BG), the Czech Republic (CZ), Denmark (DK), Germany (DE), Estonia (EE),Ireland (IE), Greece (EL), Spain (ES), France (FR), Italy (IT), Cyprus (CY), Latvia (LV), Lithuania (LT), Luxembourg (LU), Hungary (HU), Malta (MT), the Netherlands (NL), Austria (AT), Poland (PL), Portugal (PT), Romania (RO), Slovenia (SI), Slovakia (SK), Finland (FI), Sweden (SE) and the United Kingdom (UK). Given the ongoing problems in Europe, I would say there is still a substantial chance that the Euro will be abandoned by one or more countries and perhaps collapse entirely. Calculated Risk has a few comments here.